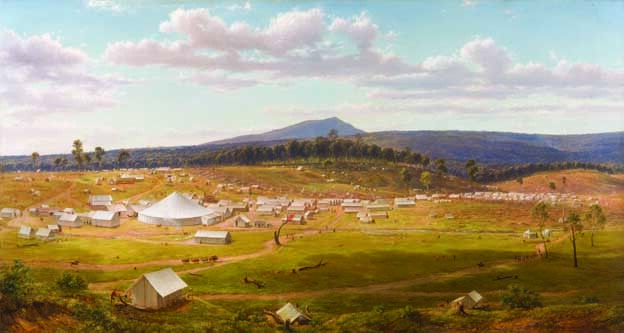 Eugene von Guerard, Old Ballarat as it was in the summer of 1853-54, 1884, oil on canvas, mounted on board, Art Gallery of Ballarat Collection, Gift of James Oddie on Eureka Day, 1885. Gold discovered at Buninyong by Thomas Hiscock. A protest against the gold licence was held at Buninyong. Ballarat's first Gold Commissioner, Francis Doveton, arrives at Ballarat. The 40th (2nd Somersetshire Regiment) arrived in Victoria from England at the request of Governor Charles LaTrobe. A small detachment of the 40th Regiment of Foot are sent to various Victorian diggings to augment the police force. Bendigo diggers met to protest at the gold license fee and other grievances. It was determined to start collecting signatures for a 'Monster Petition' and an Anit-Gold Licence Association is formed. Around 6,000 miners attended an anti-license meeting at Bendigo. A huge meeting was held at Bendigo. Diggers agree to either offer 10 shillings for the next month's fee, ornot to pay next month's license and wear red ribbons to advertise non-payment of the license fee. Another meeting is held at Bendigo. 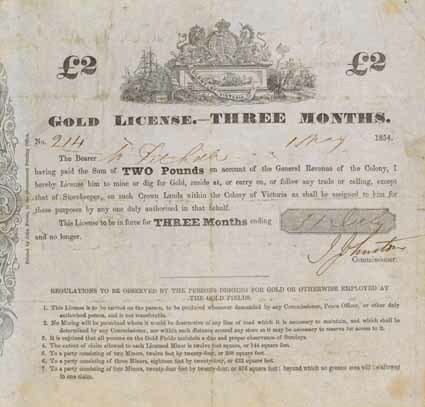 A new act reduced the licence to 40 shillings for three months, and allows a Licence to be taken out on any day of the month for one, three or twleve month periods. New Constitution Bill for Victoria and Bill to extend the Elective Franchise (conferring vote on holder of 12 months mining licence with certain residence qualifications) sent to England. Departure of Governor Charles La Trobe. Henry Foster acts at Lieut-Governor pending Charles Hotham's arrival. Robert Rede becomes Ballarat’s resident Gold Commissioner, replacing Clow. Father Patrick Smyth is transferred to St Alipius' Catholic Church. Captain Sir Charles Hotham arrives in Melbourne to take up the position of Lieutenant-Governor of Victoria. Hotham faces financial debot, and orders weekly license huts as a revenie raising exercise. Arrival of Governor Charles Hotham. Governor Charles Hotham orders license inspections twice weekly instead of once per month,  to further increase revenue. Victoria faces increasing financial difficulties. James Bentley, Catherine Bentley and John Farrell were arrested for the murder of James Scobie. Peter Lalor leads a deputatoin of diggers to Commissioner Rede seeking to have the case reopened. Rede agrees. Johannes Gregorius, the disabled Armenian servant of father Patrick Smyth failed to produce a license when requested by Constable James Lord. The policeman reportedly beat Gregorius. A priest's servant was not required to carry a license. Magisterial Enquiry discharges James Bentley  due to lack of evidence. Many diggers believe Magistrate John D'Ewes is a friend and business partner of James Bentley. A meeting is held at Bendigo to support the Ballarat diggers. The creation of a Goldfields Reform Society is mooted. A Monster meeting is held at Bakery Hill after the Catholic church service, to protest at the actions of Trooper James Lord. It is mainly attended by Catholics. There is a resolution to meet again the following Sunday to discuss actions. A mass meeting of around 10,000 was held near the site of James Scobie's murder. They wanted a more thorough investigation of his death. As time passed the crowd grew aggressive. The hotel was looted and burnt to the ground. The Police and Military cannot control the crown and Commissioner Robert Rede is pelted with eggs. Police reinforcements arrived in Ballarat. 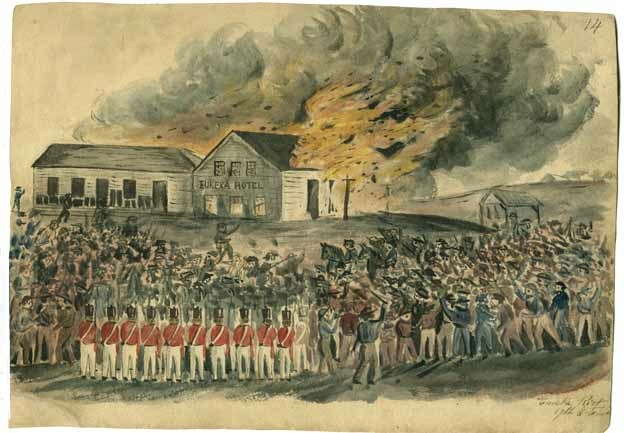 Andrew McIntyre, and Thomas Fletcher and Westerby were arrested for their alleged part in the destruction of the Eureka Hotel,  and charged with riot. A meeting was held on Bakery Hill where those in attendance agreed tp pay the bail Andrew McIntyre and Thomas Fletcher. Charles MacMahon, acting Head of the Police force, and Police Magistrate E.P.S. Sturt, arrived in Ballarat from Melbourne. Peter Lalor and Thomas Kennedy stir up diggers at a public meeting after Mass. Protest Meeting against the treatment of Father Patrick Smyth's servant, Gregorius. Garrison Commander Captain John Thomas developed a detailed plan for the defence of the Government Camp at Ballarat. Further Military reinforcements arrive from Melbourne. Governor Charles Hotham established a board of enquiry into the James Scobie Murder, and the actions of the Camp officials, to quell the unrest. The enquiry sat in Ballarat pm 02 and 10 November. A Board of Inquiry into Conditions on the Goldfields is set up at Bath's Hotel (later Craig's Hotel), Ballarat. A Board of Inquiry appointed by Governor Charles Hotham investigates allegations of corruption at Ballarat begins at Bath's Hotel. Robert Rede sends forty police back to Melbourne and Geelong. Alfred Weir received a membership ticket to the Ballarat Reform League. The meeting expressed regret at recent events, condemned the use of arms by the stockade faction, called on the Crown's officers to show mercy, pledged itself to using constitutional meant to having the miners' grievances addressed and called for a copy of the resolutions to be forwarded to Governor Charles Hotham. The members of the deputation to be to to the Government camp were Thomas Williams (the chairman), Fr Patrick Smyth, J.B. Humffray, Edward Donald and Mr Mostered. James Bentley is convicted of manslaughter of James Scobie. Andrew McIntyre, Fletcher and Westerby were convicted of 'riot'. A detachment of the 12th Regiment entered Ballarat, passing though the Eureka Lead. They were attacked by angry diggers. Drummer John Egan, and civilian transport diver, Young, were wounded. 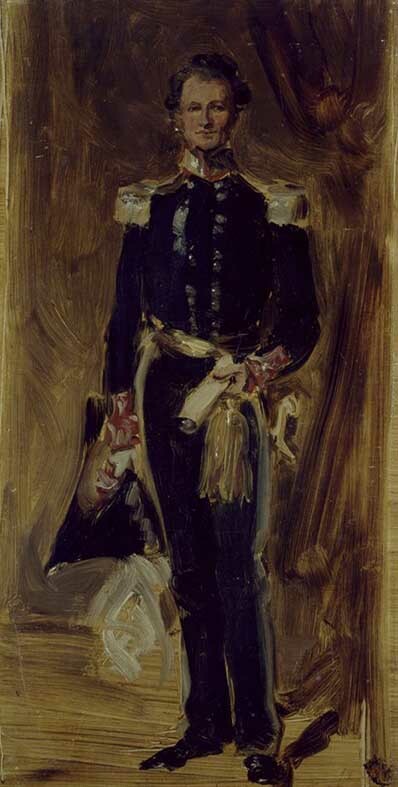 A dinner was held at Ballarat to the American Consul, James Tarleton. Distant shots were heard during the dinner and officials left hurriedly. James McGill rushed in and whispered a password, thought to be the Celtic 'Faugh-a-balagh' meaning 'clear the way. The diners knew the army was on the way. Over 10,000 people attended a 'Monster meeting' at 2.00 pm on Bakery Hill and the Eureka Flag is unfurled. The deputation of diggers report on their meeting with Governor Charles Hotham, and a number of diggers burn their licenses. In the late afternoon on [Bakery Hill] diggers swore an oath by the Southern Cross to defend their rights. Peter Lalor becomes leader of the diggers and calls for volunteers. Robert Rede reads the Riot act and troops fire a volley over the diggers heads. A number of diggers move to the Eureka Lead and erect a barricade which becomes known as the Eureka Stockade. The building of the Eureka Stockade was completed. Assistant Commissioner Gilbert Amos of the Eureka Camp was briefly held prisoner by some of the Stockaders and his horse taken. Father Patrick Smythe tries to persuade Catholics to lay down their arms and attend mass the nest day (Sunday). 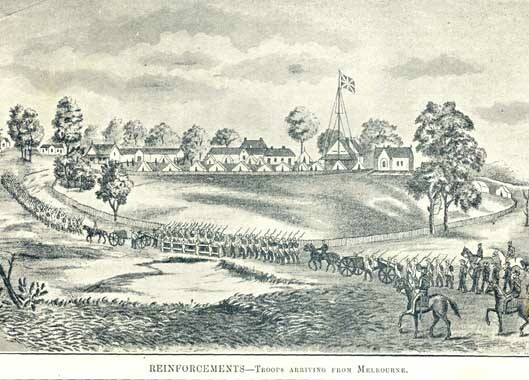 Eureka Stockade battle is fought at dawn led by Captain Thomas, and a well armed contingent of 296 soldiers and Police. Twenty two diggers and seven military are officially lised as killed. Many others are wounded. A meeting of the Ballarat Reform League was organised for 2pm on 03 December 1854 at the Adelphi Hotel. The intention was to elect a Central Committee of the Ballarat Reform League, and that each 40 members would have the power to elect one member for the Central Committee. Robert Rede released a Proclamation after the Eureka Battle. Her Majesty's forces were this morning fired upon by a large body of evil-disposed persons of various nations who had entrenched themselves in a stockade on Eureka, and some have paid officers and men were killed or wounded. Several of the rioters habve paid the penalty of their crime, and a large number are in custody. All well-disposed persons are requested to return to their ordinary occupations and to abstain from assembling in ground, and every protection will be afforded to them. Major-General Nickle arrives in Ballarat and takes command. In Melbourne a public meeting of over 4,000 people condemned the actions of the Government and called for the resignation of Foster. Tom Wilson came very near to getting shot on Monday night after the Stockade affair. The (Government) Camp took false alarm and kept up a continued fire all over the flat which is densely populated. For maore than 20 minutes the thickest of the fire fell were Tom was living, riddling the tents all around about. The ground had been rushed at one time but afterwards left doting the locality over with holes from three to four and five feet deep(one to 1.5 and 1.8 metres), to these holes the inhabitants crowded for safety and Tom among the rest. Unfortunatley the one he got into had been used for a certian purpose - but he won't tell ohow much soap ot cost him to make his clothes nose sweet again though we often ask him. On the Monday Night, the fourth of this month (December), I was on teh flat a short distance from the bridge her about seven or eight o'clock when I head the rapid and consecutive reports of an immense number of firearms, and I heard a number of bullets whiz over my head, and i sat upon the gound to escape the bullets. Robert Rede released a Proclamation on 03 December 1854 after the Eureka Battle. 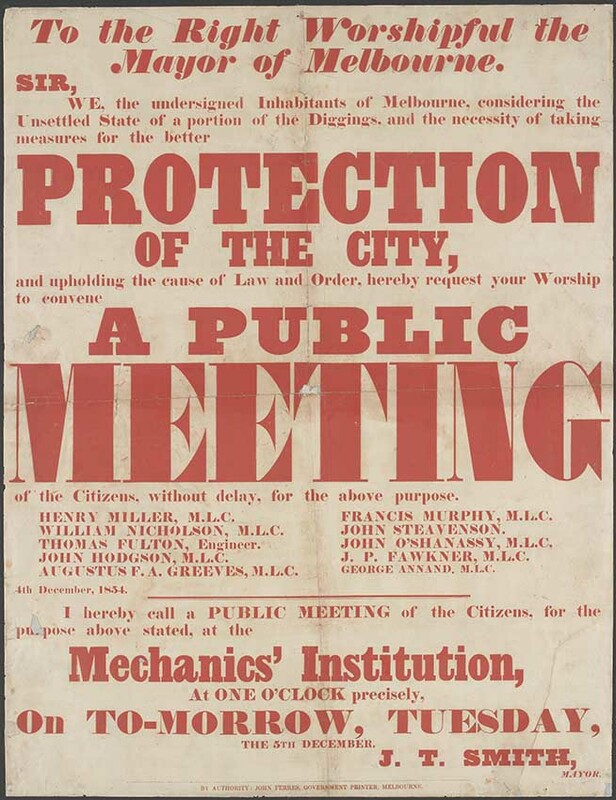 A public meeting was held in Melbourne regarding measures to protect the city after the Eureka Stockade. A group of 13 prisoners are charged with treason. A meeting of around 6000 Melbourne residents meet at St Paul’s Cathedral to condemn the actions taken by the Government and the administrators in Ballarat. Colonel Secretary Henry Foster resigns. Governor Charles Hotham declares a state of martial law in the district of Buninyong which covered Ballarat. Major General Sir Robert Nickle, K.H., Commanding the FOrces in the Australian Colonies, announces to Her Majesty's subjects, Civil and Military, that, acting under the authority of His Excellency, the Lieutenant Governor of Victoria, He has assumed command of the force at Ballarat, to restore confidence and to preserve the lives and property of all peaceful persons. The inhabitants are recommended to pursue their ordinary lawful avocations as heretofore. 1. Stores of every kind may be brought into the District, exept Arms and Ammunition; and any conveyance containing Arms and Military Stores will be confiscated, and the persons in charge will be tried by a general Court Martial. 2. All persons in whose possession or on whose premises Arms of Ammunition may be found after Twelve o'clock on the day of Saturday, the Ninth of December, will be tried by a general Court Martial. 3. All persons having Arms and Ammunition in their possession, are hereby required to deliver them, by that time, to a Storekeeper at the Camp, appointed to receive, and register, and to give a receipt for the same. 4. Should any insult or violence be offered to any Soldier, or Policeman, or any recognised authority, the offending persons will be tried by General Court Martial. 5. Should a shot be fired on the Camp, or on any of the above-named authorities, from teh neighbourhood of any Tent, it will be immediately burned down, unless the occupants give such information as shall lead to the conviction of the perpetrators of such outrage, who will, in every case, be tried by a general Court Martial. 6. Any persons found lighting a fire, having an appearance of a signal fire, will be tried by a general Court Martial. 7. Officers commanding the Force, whether Civil or Military, now serving withinf this District, will receive orders through the medium of the Deputy Adjutant General, and will in like manner make their reports for Sir Robert Nickle's consideration. 8. Public Meetings are prohibited, except with the premission of the Major General. Ballarat Police Courts commit 13 diggers for trial on charges of high treason. Martial Law was repealed at Ballarat. A rally of 1500 miners, shopkeepers and other took place on Bakery Hill. The meeting expressed regret at the recent stocade fation, called on the Crown's officrs to show mercy, pledged itself to using contitutional meants to having the miners' grievances addressed and called for a copy of the resolutions to be forwarded to Governor Charles Hotham. J.B. Humffray was arrested. Robert Nickle returned to Melbourne, although a large part of the army remained for some time. His health deteriorated, possibly due to his exertions in the Ballarat heat. The first Ballarat sitting of the Gold Fields Commission sat at Bath's Hotel, Ballarat. Agitation for amnesty of Eureka prisoners. Governor Charles Hotham orders Gold License hunts to resume. Members of the gold Fields Commission meet with Governor Charles Hotham informing him that even though their investigations were not complete they were unanimous in recommending the abolition of the Gold Licence. Members of the Gold Fields Commission recommend to Governor Charles Hotham that a general amnesty for all those connected with the Eureka Stockade be declared. The request is refused. The License Hunt Again. — A public meeting will be held on Bakery Hill, at four o'clock on Wednesday 10th January, 1855. 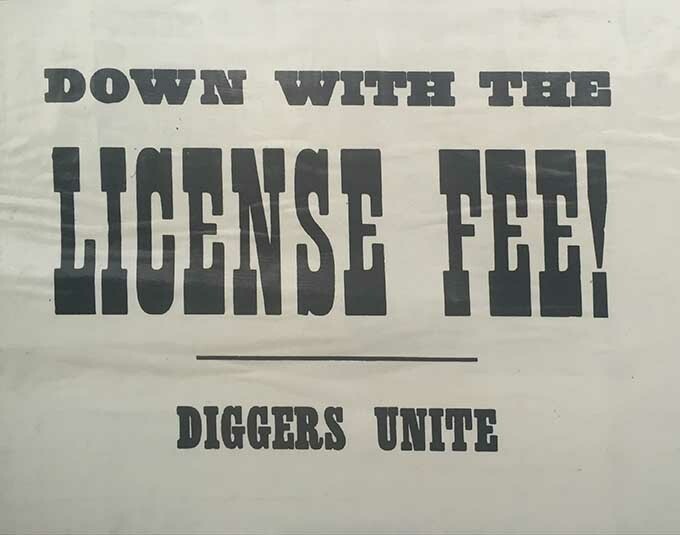 Diggers of Ballarat — The Resident Commissioner has announced his intention of coming out to search for unlicensed diggers, on Thursday, 11th instant, and all diggers are invited to attend, and decide upon some peaceable, but united action on the occasion. In accordance with the terms of teo foregoing placard, a monster meeting will be held today, at which the question of license hunting and government tergiversation will be freely and fully discussed. I learn that most of the well-disposed dig-gers will be prepared to act in unison with the advice of the committee of the 'Victorian Reform League,' and that the opposition, though strong and determined, will be conducted by the people on constitutional principles The men of Ballarat have sufficient discrimination to know whence the folly and impolicy of this new move springs, and they are anxious to put the saddle on the right horse, viz. the Lieutenant Governor himself, Yesterday a deputation from the committee of the 'Victorian Reform League' waited upon the Chief Commissioner at the camp, for the purpose of hearing the cause and objects of his notice; but little satisfaction was given, as Charles Wade Sherard, Esq. refused to make any statement ia reply, except through tho medium of written documents. To leave no excuse on this question, the Committee have ordered their deputation to pre sent the Commissioner with an authoritative letter on the subject at an early hour this morning and by his answer, in a great measure, may be shaped the course matters will take at the public meeting this evening. Popular indignation is fired up to the highest pitch at this unwarrantable conduct of the Executive, after its having been generally understood, from the pro ceedings of the Commission of Inquiry, that Sir Charles Hotham was disposed to meet the popular wishes, and listen to the report of his commission, which it is well-known will denounce the collection of the iniquitous license-tax. Henry Seekamp, the editor of the Ballarat Times, was tried and found guilty of sedition. On 26 January he was sentenced to six months in prison. 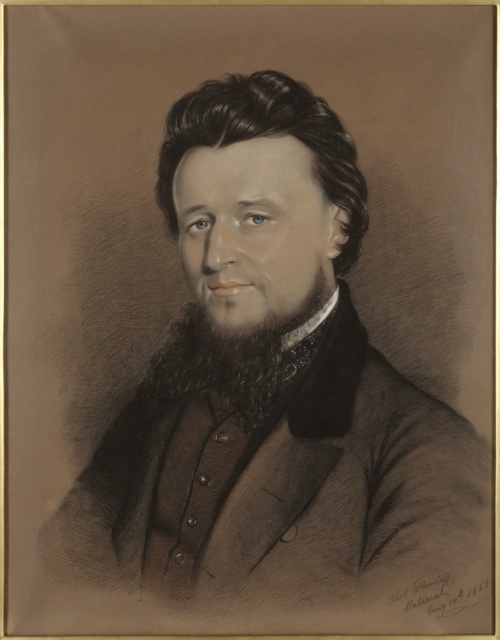 Henry Seekamp is found guilty of seditious libel, and on 26 March 1855 starts a 6 month prison sentence. In Bendigo around 400 people attended a meeting to raise funds for the defence of the Ballarat diggers who had been tried with treason. After the meeting an effigy of Attorney-General, William Foster Stawell, was burned. The trials of the thirteen diggers charged with treason commenced. John Joseph was the first to be tried. John Manning was the second digger charged with treason to be tried. Timothy Hayes, charged with treason, was tried. Raffaello Carboni, charged with treason, was tried. Jan Vennik, charged with treason, was tried. Henry Reid, James Campbell, William Molloy, Jacob Sorenson and John Phelan, all charged with treason, were tried. Gold Fields Commissioner reports in favour of gold fields reform. The Gold License was abolished, Local Courts to be elected by miners and a 'Miners Right' of 1 pound a year which conferred electoral rights. The Miners Right gave miners the right to mine gold and entitled its bearer to a vote in parliamentary elections. A public meeting was held at the stump on Bakery Hill to organise a welcome back for the 13 diggers who were acquitted after being tried for treason. A benefit was held in Ballarat for Peter Lalor. A benefit night was given to Lalor, on Monday last, in the Adelphi Theatre, the professionals and the proprietors of the Adelphi, Messrs Moody, Nicholas & Co., gave their services and the house free. The pieces chosen for the occasion were " Pizzaro," and " My Neighbour's Wife." between which came several airs played by Richty's splendid band, just arrived in the colony, and at present giving concerts in the Prince Albert Hotel. Then came Raeffelo with the Marsailles, Creed Royal with several solos on the flute, and Thatcher with his comic songs. The music was encored most determinedly. Mr Lalor came before the curtain, and briefly thanked them. When he came out there was a perfect hurricane of applause. He lifted his hand, and all was still as death until he had finished his address. The house was crowded to suffocation; all parties, those who agreed with him, and those who did not, for once agreeing io pay him all honour for his sincerity. A very singular phase of the evening's amusement was the presence of nearly as many ladies as gentlemen. The proceeds are handsome; I have not yet heald the figure-probably about £100. Last evening's news, though brief, was largely sought after. It would be useless to tell of the opinions and prophecies for good and evil that were uttered. One thing is clearly evident, that if Her Majesty has not in her dominions more disloyal subjects, then she is truly blessed. The existence of this feeling of loyalty, for which Sir Charles himself once gave us credit, and which we never threw aside, speaks volumes in con demnation of the State Trials. New Electoral Act framed to give representation to mining areas in existing Legislative Council. 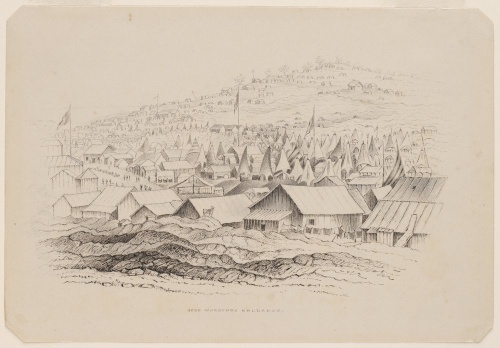 The third Goldfields' Act was proclaimed, and incorporated the changes suggested by the Royal Commission. Raffaello Carboni was one of nine diggers elected to the local court at Ballarat. Peter Lalor and J.B. Humffray were elected to the Legislative Council. A meeting was held on the site of the Eureka Stockade. Daniel Sweeney was in the Chair to consider the subject of compensation to the sufferers of loss incurred by the soldiers eleven months earlier. Governor Charles Hotham dies at Melbourne. Costs relating to the Eureka Stockade were released. We have Melbourne papers to the 17th. inst, A Council paper, just published, states that an outlay of £26, 733 18s. 6d. was incurred by the Ballarat riots, —the items being as follows : Expenditure for military, £19,871 0s. l0d. ; police, £230 18s. ; conjointly for both services, £5119 13s. 8d. ; contingencies, £1512 6s. John Lynch gave an oration on the site of the Eureka Stockade. There was a small procession to the site, and about 200 people assembled. At the conclusion of the oration a procession then marched to teh Ballaarat Old Cemetery where another oration was presented by Dr Harry Hambrook. 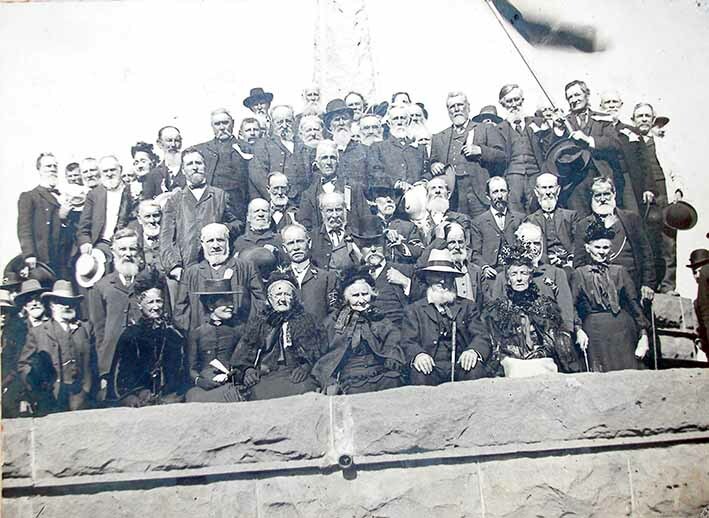 Eureka Veterans at the 50th Anniversary of the Eureka Stockade, o4 December 1904. Ballarat Heritage Services Picture Collection. 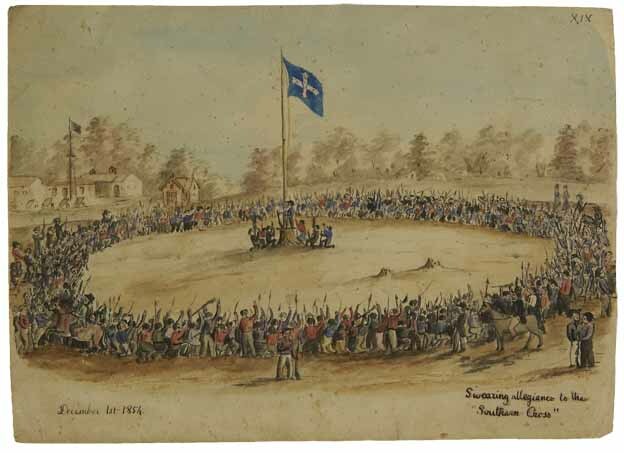 50th Anniversary of the Eureka Stockade. The Eureka Stockade Centre Appeal edged towards the one million dollar mark. The appeal director was Barry Tinkler amd the appeal committe chair was Pam Davies. Southern Cross flags were flown in Commonwealth Avenue in Canberra, outside Parliament House, in recognition of the 150th anniversary of the Eureka Stockade. ↑ http://www.myplace.edu.au/decades_timeline/1850/decade_landing_15_1.html?tabRank=2&subTabRank=2, accessed 19 October 2016. ↑ Rich, Margaret (Ed), Eureka, Ballarat Fine Art Gallery. ↑ McFarlane, Ian, Eureka from the Official Records, Public Record Office of Victoria, 1995, p 192. ↑ McFarlane, Ian, Eureka from the Official Records, Public Record Office of Victoria, 1995, p 193. ↑ McFarlane, Ian, Eureka from the Official Records, Public Record Office of Victoria, 1995, p 194. ↑ Eureka 150, Ballarat Courier Supplement, 24 November 2004. ↑ McFarlane, Ian, Eureka from the Official Records, Public Record Office of Victoria, 1995, p 195. ↑ McFarlane, Ian, Eureka from the Official Records, Public Record Office of Victoria, 1996, p 196. ↑ McFarlane, Ian, Eureka from the Official Records, Public Record Office of Victoria, 1996, p 197. ↑ Eureka150, Ballarat Courier Supplement, 24 November 2004. ↑ The Age, 11 January 1855. ↑ Geelong Advertiser, 04 May 1855. ↑ McFarlane, Ian, Eureka from the Official Records, Public Record Office of Victoria, 1996, p 200. ↑ Ballarat Courier, 15 May 1954. ↑ Tasmanian Daily News, 22 May 1856. ↑ Chisholm, J.A., A few notes o the site of the Eureka Memorial, 1974. ↑ Ballarat Courier, 28 November 1997. ↑ The Age, 03 December 2004.